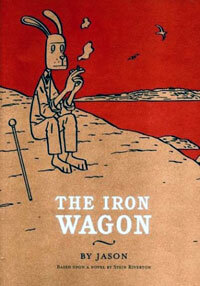 He was born John Arne Saeteröy in Molde, Norway in 1965, but we know him as Jason, the brilliant cartoonist behind the English language editions of his novellas HEY, WAIT… and THE IRON WAGON, published by the fine folks at Fantagraphics Books. Jason began his career at the age of 15, publishing cartoons in a Norwegian magazine (KonK). In 1991, he began to collect the first of many prizes for his comic art. Later, he entered the Art Academy of Oslo, where he graduated in 1995. 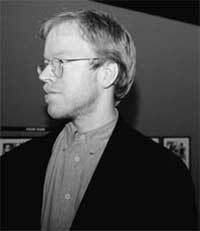 1995 also saw the publication of his first graphic novel. In 1997, he founded the magazine MJAU MJAU (Meow, Meow), where he developed his own style, a kind of silent or pantomime comix, using (funny) animals as his main characters. Would you mind introducing yourself to the readers, perhaps with a little biographical information and brief description of your work? JASON: Not that much to say, really. Born in Norway in 1965, got hooked on comics in my early teens, started selling cartoons and short strips to a humor magazine while in high school, went to art school in Oslo late eighties to early nineties, and worked as an illustrator and cartoonist since then. My first album was published in 95, drawn in a realistic style. Two years later I got my own comic book, MJAU MJAU, where I started working more in direction of animal characters. 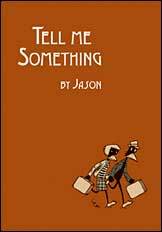 Would you also mind describing Tell Me Something, your most recent work published in the U.S. by Fantagraphics Books? JASON: Well, it's sort of an homage to silent film, I guess. The films of Buster Keaton have been an inspiration. It's about a poor poet who meets an upper class girl, and the forces that try to separate the two. The story goes back and forth between the 20s and the present. I fear giving the readers the wrong information about why you draw your cartoons in pantomime or with little dialogue, but is the reason because you want to make the work easier to translate into many languages? Or maybe the question should be, why do your cartoons look the way they do? JASON: That was one of the things I had in mind when I started doing wordless comics, Norwegian not being a major language. The reason I still like working in that style is that those comics leave more for the readers, they have to go into the story and do their own interpretation, much more than in comics with dialogue, I think. Besides, the dialogue has for me always been the hard part. I think more in images than in words. Just skipping the words has made it easier to tell stories. Is the comic Mjau Mjau still the comic where your work first appears? And how involved are you with the Jippi Comics? Are you part owner or is it only the company that publishes your work? JASON: Jippi is a small publishing company, consisting for the most part of two people. They publish young cartoonists that have trouble seeing their work printed at larger publishers. Recently, I have been published by such a larger publisher, but I still keep in contact with Jippi, and they will soon publish a collection of the two first issues of Mjau mjau. Do readers often inform you that they're having trouble interpreting your comics because of the comics are wordless? Or do they really like that? And do you fear the day when you abruptly do something different (like Bob Dylan going from acoustic to electric) and alienate everyone? JASON: Some people have found TELL ME SOMETHING to be confusing, and people sometimes ask me, what really happens at the end of HEY, WAIT... Not that I want to give any answers. I prefer each reader to do his own interpretation. I feel like I've already done something different in THE IRON WAGON. In Tell Me Something, the two whirlwind romances are fraught with trouble. Is the story about troublesome star-crossed romances, or is it less literal and more impressionistic? I ask because whenever I read one of your comics, I find myself feeling more than thinking, so sometimes I think I'm missing some kind of "point" you're trying to make. JASON: I don't try to make any points at all. If you feel more than you think, that's good. Thinking is overrated, anyway. Reading Tell Me Something reminded me of a quote from a film history text I read years ago. The writer said that many film fans considered the introduction of sound to be a corruption of film. He said the viewer should understand film purely from visuals. Watching silent film, I'm surprised by how much I can read into them. However, I may interpret something as comedy when it wasn't meant to be comedy because I don't have audio cues to "help" me. Do you worry that the readers will misinterpret your comics or are you not that possessive about it? JASON: If ten people read my comics and see it in ten different ways, that's kind of what I want. That's what I like about silent comics. When you remove the dialogue, you remove an important part of comics, but you also gain something, a more magical quality that makes the reader in a bigger degree participate in the story. Do your comics require a lot of preliminary work? Although your stories are short, each panel says so much that your work has the effect of a longer story. So I was wondering if you put a lot of time into creating six perfect panels per page. JASON: I mostly draw directly on the original, skipping doing a script and sketches, but it's very important to me that the page is easily readable. I see each page as a unit and try hard to let the storytelling be as clear as possible. That's even more important if you don't use dialogue. I had not heard of you until an American comics columnist mentioned that you had made Time magazine's "Best of" list for 2001. Was that an important thing for you personally or professionally to make the list or did you ignore it? JASON: It's nice, but it's one man's opinion. The American comics press is mostly wedded to superhero comics. After the Time notice, did you see a marked increase in interview requests? JASON: Not really. It seems to have made a bigger impression in Norway. Lots of journalists here used the TIME notice as a hook for their articles. Have any of the American "mainstream" comics publishers like DC, Marvel, or Image contacted you about creating a comic for them to publish - either an original work or something work for hire like a Batman graphic novel or an X-Men mini-series? Or are you really interested in pursuing your own work? I do remember in a THE COMICS JOURNAL interview that you mentioned being a fan of Neal Adams' Batman comics. JASON: I'm not really that interested in superheroes. I think BATMAN: YEAR ONE and [DAREDEVIL:] BORN AGAIN are great comics, and shows that there are possibilities of doing interesting work within that genre, but it's not something I particularly want to do. Fantagraphics really pushes your work (as they do for all their cartoonists), so how did you come to have a relationship with them? JASON: My publisher in Norway sent Kim Thompson [Fantagraphics' co-publisher] a lot of my comics, knowing that he could read the Scandinavian languages. At that time Thompson had already read the French version of Hey, Wait..., and he wanted Fantagraphics to do the English version. What is comics publishing like in Norway? What kind of work tends to be popular? And how is your work received in Norway and in the rest of Europe? JASON: For some reason, newspaper strips are probably the most popular form of comics in Norway. And as in the rest of the Nordic countries, Donald Duck is very popular. I guess my comics are seen as melancholic and Scandinavian in tone in the rest of Europe and in the US. What Jason comics, both in the U.S. and in Europe, can we look forward to in the immediate future? And are there any comments you'd like to make before we close the interview? JASON: Fantagraphics will publish my new book, YOU CAN'T GET THERE FROM HERE in June, and Carabas will publish my first full colour album, JE VAIS TE MONTRER QUELQUE CHOSE in September. Jippi in Norway will publish a hardcover collection of Mjau Mjau 1 & 2, and previously uncollected stories. This book will also include a colour section with some of my illustrations. I hope to be able to bring a few copies with me when I come to SPX in October. THANKS, JASON. And a major big ups to Jason who responded to these queries twice because CBB's ISP punked out and lost an entire weekend's worth of site data and to Eric Reynolds, Fantagraphics PR wonder boy for helping me get this interview. The Jason art site is www.mjaumjau.net, which also has an extensive bibliography of his work published in many nations. 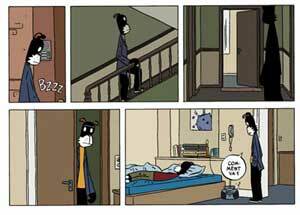 You can find out more about his work at www.jippicomics.com and buy English translations and some imports of his work at www.fantagraphics.com, the publishing home of the world's best cartoonists.